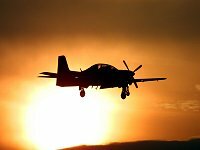 The RAF's basic flying trainer is the Tucano T1, which is powered by a Garret TPE331 turbo-prop engine. The Tucano replaced the venerable Jet Provost in RAF service, the turbo-prop design being chosen for it's greater fuel efficiency and lower operating costs. The handling of the Tucano is very jet-like and it's tandem cockpit layout prepares the student pilot for progression to the Hawk T1 advanced flying trainer and then to fast-jet aircraft on the front line. Like all RAF training aircraft, the Tucano was re-painted in a black and yellow colour scheme just a few years ago. This high-visibility scheme was selected as it had been demonstrated that the human eye can pick out a moving black object against most backgrounds more readily than any other colour. An additional bonus is that the gloss black and yellow scheme does look good for display aerobatics also ! No 1 Flying Training School (No 1 FTS) was established in July 1919 at Netheravon, known for a short time as the Netheravon Flying School. Since this time, numerous changes in the size and role of the School have occurred. The School has disbanded and reformed many times and has been stationed at various locations including Leuchars, Oakington and Ambala near the Indian city of Delhi. For many years leading up to the Second World War the school trained Naval and Army Officers for service with the Fleet Air Arm and Army Co-operation Squadrons. In 1940 the pressing need for pilots in the RAF at the time meant that some Naval Officers were posted to RAF operational units instead of Fleet Air Arm Stations. During World War II, the School used the first 'lead-in' and 'lead-out' lights, which subsequently became a feature of all airfields. Also during this time, the first examples of instrument flying can be found. The aircraft used by No 1 FTS training have included the Avro 504K, Bristol Fighters, North American Harvards, Tiger Moths and both the Piston and Jet Provost. The first Tucano T Mk 1 arrived in April 1992 to replace the Jet Provost which had amassed over 630,000 flying hours during its' time. No 1 FTS is currently located at RAF Linton-on-Ouse, Yorkshire and in 2002 it's resident Squadrons received the honour of inheriting historic Squadron Numbers. No 1 FTS now comprises, Central Flying School (Tucano) Squadron, 72 (R) Squadron and 207 (R) Squadron. However, it's responsibility remains the same, that of providing Basic Fast Jet Training for all new RAF pilots and to train and provide Qualified Flying Instructors to meet this task. Powerplant :	One Garret TPE331 12B turboprop, producing 1100 shaft horse-power. 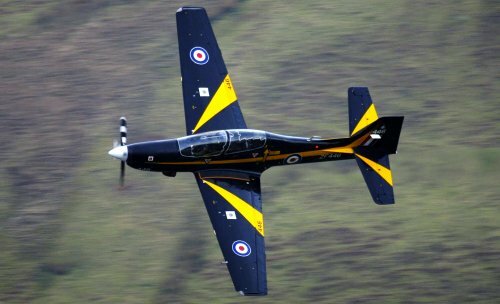 The 2003 Tucano Display Pilot, Flight Lieutenant Martin Day, is an A2 'Standards' Qualified Flying Instructor and Instrument Rating Examiner of the Central Flying School, RAF Linton-on-Ouse. Martin left his hometown of Winchester to attend University at Cardiff where he joined the University Air Squadron and flew the Bulldog. 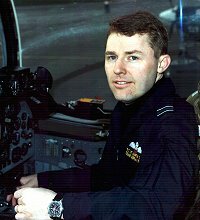 He joined the Royal Air Force in 1990 and first flew the Tucano as a student at RAF Cranwell and subsequently the Hawk at RAF Chivenor, before being re-streamed from Hawk weapons training to helicopters in 1993. Following training at RAF Shawbury, Martin was selected for Search and Rescue duties on the Sea King and was posted to 22 Squadron at Wattisham. During his 4 years there, he rescued 8 military aircrew ejectees and saved many more civilians. He was twice detached to 78 Squadron in the Falkland Islands in addition to detachments to other UK SAR bases. In 1999, Martin returned to fixed-wing flying to become an Instructor at Linton. Martin is married to Sally and has one young son, Thomas. They have spent the last year renovating a barn conversion in which they now live. Martin's interests (now) include DIY, skiing and he is also the drummer and manager of a rock band based at Linton. Martin is in his first year as display pilot and has always aspired to fly low level display aerobatics ever since winning the Battle of Britain Trophy for aerobatics when he was a Tucano student back in 1991. • Stall Turn (dirty) to Land. • ½ Barrel roll, stopped inverted and converted into descending maximum rate spiral. • ¾ Loop with 90° vertical roll during last ¼. • Out on 45° axis for reverse stall turn with roll through 90° in vertical on way down. Thanks to Flt. Lt. Martin Day for photos & information and Chris Chambers for the photograph of the low level Tucano.